With nearly 3,000 hectares of beautiful scenery, a trip to Connemara is not complete without a visit to Connemara National Park. Located near the village of Letterfrack and the famous Kylemore Abbey, this scenic area offers an insight into the unspoilt wilds of Connemara, and is one of only six National Parks in the Republic of Ireland. The picturesque landscape is made up of mountains, woodlands, heaths, bog lands and nature trails. A large number of wild bird species, such as the skylark, stonechats and peregrine falcons call this protected environment home. Other residents include red deer and Connemara ponies to name a few. The Visitor Centre was formerly a farm building which belonged to Letterfrack industrial school. Visitors to Connemara National Park Visitor Centre can learn more about the area, view exhibitions, and in the summer months, treat themselves to some light refreshments in the tea rooms. 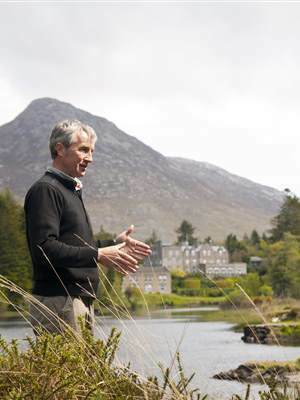 Connemara National Park has a number of walking trails and paths to suit every ability. The looped walk has gravelled footpaths and boardwalks, but many visitors come to climb the majestic Diamond Hill. Standing at 400m high Diamond Hill offers stunning views of not only the park, but in the distance, you can see the islands of Inishbofin, Inishturk and Inishshark, as well as Kylemore Abbey and the Twelve Bens mountain range. Both the looped walk and the Diamond Hill walk are very well signposted and begin on the same route, starting from the Visitor Centre and walking up a gentle slope before those completing the Diamond Hill climb veer off towards the mountain. The loop walk continues around allowing walkers to soak up the beautiful views of this unique area before returning to the Visitor Centre. 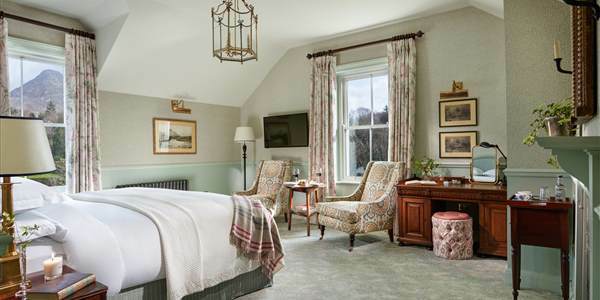 After a day spent exploring Connemara National Park return to Ballynahinch Castle and relax and unwind in one of 48 beautifully appointed rooms. 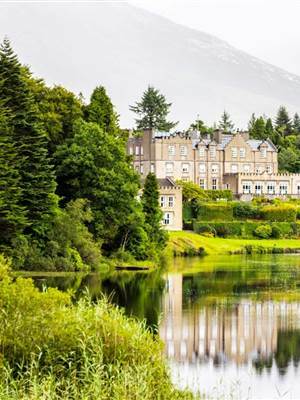 Located a 25 minute drive from Ballynahinch Castle.